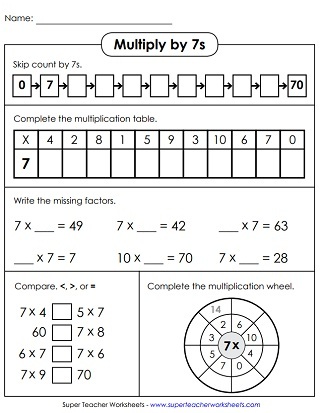 Here you'll find basic multiplication facts up to 7, as well as worksheets with only 7s. 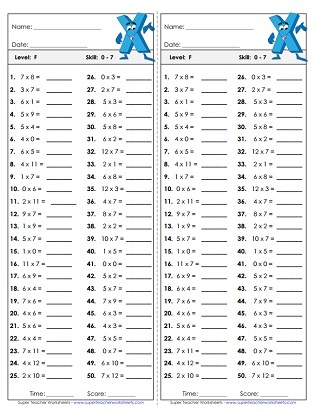 We also have skip counting practice sheets as well. This worksheet has a skip counting number line, missing factor problems, a multiplication wheel, comparing questions, and a number table. Multiply by 7s and write the answers. Then use the key at the bottom to determine how each section should be colored. Mystery picture is a colorful castle with flags. One way to have students use this puzzle is to "find their partner". Give each student one puzzle piece. Half of the students will have a multiplication fact and the other half will have the answers. Have them find their "partner" with the matching piece. In this printable math activity, children will multiply by 7s in order to fill in the blank bubbles on the multiplication caterpillar. Cut and fold to make an origami fortune teller game (aka cootie catcher). Learn and practice basic facts with factors of 7. Answer the critical thinking questions and solve the word problems. 0, 7, 14,... what is next? Skip count by 7s along the number line to find out. Count by 7s to complete the dot-to-dot. The picture is a pig. Then solve the multiplication facts at the bottom of the page. Count by 7s. Write the numbers on the penguins' bellies. Numbers go all the way up to 161. Count by 7s and write the missing numbers on the balloons. These numbers go up to 168. Complete the grids by filling in the missing numbers. 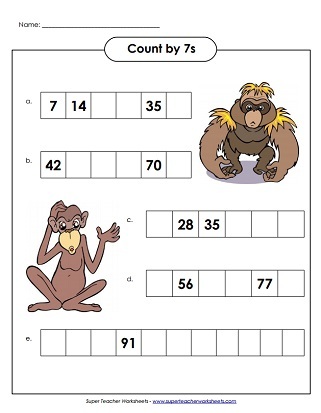 This worksheet has a monkey theme. On this drill worksheet, your students will review multiplication facts with factors of 0, 1, 2, 3, 4, 5, 6, and 7. Facts through 10s, up to 7x10. This drill worksheet has all basic facts for multiplying by 0, 1, 2, 3, 4, 5, 6, and 7. Facts include 11s and 12s, up to 7x12. This timed quiz has 50 problems on it. Covers all basic facts for 0s, 1s, 2s, 3s, 4s, 5s, 6s, and 7s. Facts through 12, up to 7x12. Basic facts with factors of 3 are the focus on these printable learning resources.